What connects a peer-to-peer platform that will allow African SMEs to merge into larger companies, a project to protect consumers from malware using a blacklisting process, another to create transparency and accountability in public tender systems in India, and a solution that gives scientists the tools to map and monitor environmental variables without having to possess advanced computer coding skills? The answer is that all of these projects are being built on EOSIO, a fee-less blockchain software protocol which boasts faster transaction speeds and lower latency than any other on the market, and whose architects believe will hasten blockchain’s mass adoption. Along with 15 other start-up outfits, the teams behind these ventures are currently in Cape Town, where they are competing in the week-long Grand Finale of Block.one’s EOS Global Hackathon series. When the series was conceived in the early months of this year, Block.one could scarce have imagined how it would capture imaginations in a burgeoning global community of EOSIO developers and enthusiasts. The software’s arrival and the ongoing improvements to it by Block.one have marked a significant development in the story of blockchain and it’s one that a broad community of early adopters has seized on. Hackathons are very much a bottom-up phenomenon in the tech sector and in the case of EOSIO they have galvanized momentum around the platform at a time when it is emerging as the protocol of choice for a growing number of organizations. 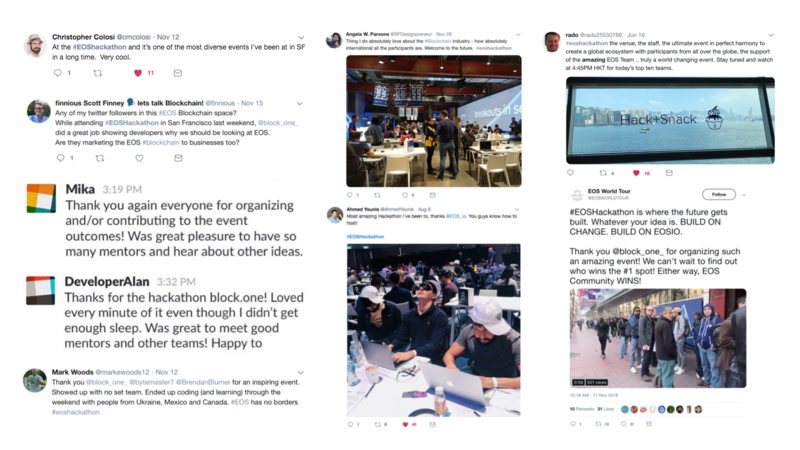 Almost 1800 individuals competed in the series’ five events prior to the Cape Town finale: four on-the-ground hackathons in Hong Kong, Sydney, London and San Francisco, and one pan-African Virtual Hackathon in October. Block.one’s judges selected three winning teams from each of those events, in addition to a Best Social Impact winner at each of the non-virtual events. A top prize of US$500,000 will be awarded in South Africa to one ultimate winner, taking total prize money dispensed during the series by EOS VC — Block.one’s venture capital arm — to US$1.5million. The format of finale week is somewhat different to previous events, where teams were given 26 hours to create blockchain solutions — using the EOSIO codebase — that “hacked” a specific challenge. In Cape Town, finalists are part-way through an Incubation Week, at the end of which their projects will be assessed in a Demo Day by a panel of international judges that includes global technology and blockchain leaders. Throughout the week, they will listen to speakers and gain insights from mentors on everything from investability to value chains and marketing, dissect exactly how blockchain fits into their tech stacks and business plans, and hone their pitches. What the series also shows is that anyone with talent and ideas can play a part in the blockchain revolution. Nowhere on this planet has a monopoly on enterprise and the genius of many of the best projects building on EOSIO is in combining tech expertise with entrepreneurial drive and initiative to address real-world issues and problems. Besides the finalists already mentioned, another project is aimed at incentivizing individuals to donate genomics data in a secure, anonymized way to further research into Alzheimer’s disease. There is an application designed to prevent food wastage through blockchain-based supply chain management, and an initiative to offer one billion-plus citizens with no formal documentation of their identity a way to establish a trusted ID that is private, recoverable and fully under their control. Each in their own way, the teams in Cape Town demonstrate a clear-sighted vision of how blockchain can benefit the world and a belief in its ability to upgrade to our global digital infrastructure. For Block.one, nurturing these grass-roots innovators and helping them to grow their ideas creates synergies with the ongoing expansion of the EOSIO ecosystem. Unfortunately there can be only one winner in the EOS Global Hackathon — but it’s clear that the start-ups it is incubating this week offer solutions that stand to benefit billions around the world.